Harry is a white dog with black spots, who doesn’t like having a bath. 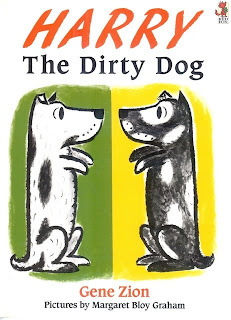 So much so, that Harry, on this rollicking neighbourhood adventure, ends up a black dog with white spots – and his own family don’t even recognise him! This delightful book is one in a series of Harry books by Gene Zion, first printed in the mid 1950s. Using that beautiful, tri-colour format so indicative of mid-20th Century books, this story is one for the precious book collection. Its timeless storyline, humour and sheer affection between the characters make the series an absolute delight for all ages.